Ceremony unity candles are still a treasured part of today's weddings. 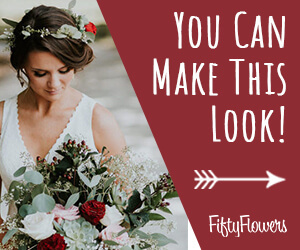 Brides do search for new ways to incorporate this lovely tradition into their own vows. Creating lush flowers in your own colors to surround your candles can be a focal point that draws everyone's eyes to it. Cut your Oasis Oval Mache in half. Soak one half in water that has been treated with Crystal Clear flower food. Wrap the half of wreath with green waterproof tape. This helps maintain the integrity of the floral foam that could crumble after many insertions of flower stems. Green in the wreath with leather leaf fern, fox tail fern and sword fern draping forward out of the cut ends in the front. Insert one taper candle directly in the foam, pushing down deep. Insert the second taper candle in a candle stake, raising it up so it is staggered in height from the first taper candle. Remove the candles and wrap for transport to ceremony venue, where you will re-insert the candles once the flower design is set into place. Be sure to always protect any wood tabletops before placing the watered design on the table. Place the pillar candle in the center of the oval, slightly to the left with the two taper candles on the right. Insert your roses, spray roses and other flowers into the foam design as shown. Do you need more help? 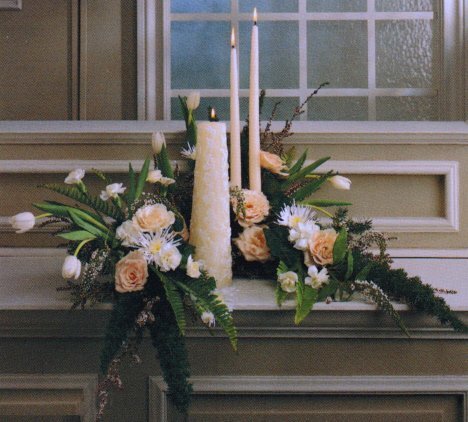 Be sure to check out Unity Candle Tutorial #1 for more help on managing the cutting of the wreath and insertions of the flowers. There are several other styles of unity candle designs with fresh flowers, be sure to check them all out.